Gelled Stain Remover for Ink, Paint & More! 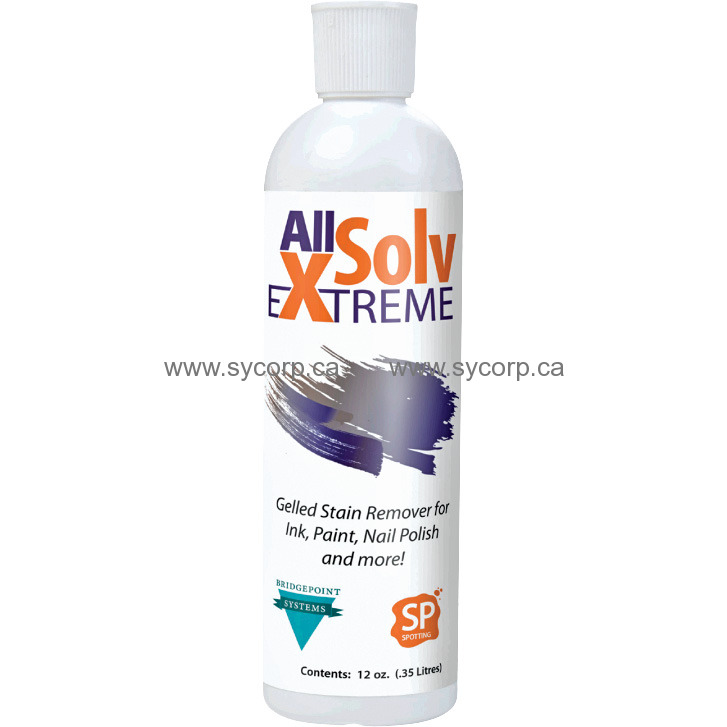 All Solv Extreme is a multi-purpose gelled solvent formulated for use on carpet and fabric that is designed to remove ballpoint pen, stamp pad , duplicating, marking, writing, felt tip and colored art inks. It also works effectively on latex, enamel, spray, and other types of paints. It can also be used to remove shoe polish, nail polish, cosmetics and adhesives. It has been specially formulated to be in compliance with the latest emission regulations and to work with Bridgepoint’s Avenge Pro™ Stain Remover. Uses variety of solvents to expand the type of stains that it is effective at removing. Special gel design to limit penetration and evaporation of solvents before their work is completed. VOC compliant in all states. Surfactant in the formula allows the product to rinse with water. Use with Avenge Pro™ to provide the ultimate in free rinsing.